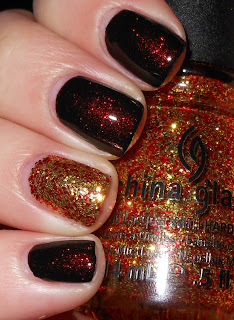 Imperfectly Painted: Time for the Hunger Games! I'm sure the non-Hunger Games fans are sick of Hunger Games posts. Trust me, I understand. I'm usually on the other side when it comes to hyped of things. I get sick of it so easily, but the Hunger Games I've fallen for. I'm heading out the door in a few minutes to go see it! This is what is on my nails. I'm wearing Wet n' Wild Black Creme, topped with Girly Bits Shift Happens, and I'm wearing China Glaze Electrify as an accent. Woo hoo! I'm so excited. This is fabulous Stephanie! Enjoy the movie!! Love your Hunger Games mani! I saw the movie at the midnight at 12:01 this morning! :D It rocked! Woohoo! I'm liking your mani more than mine. lol! 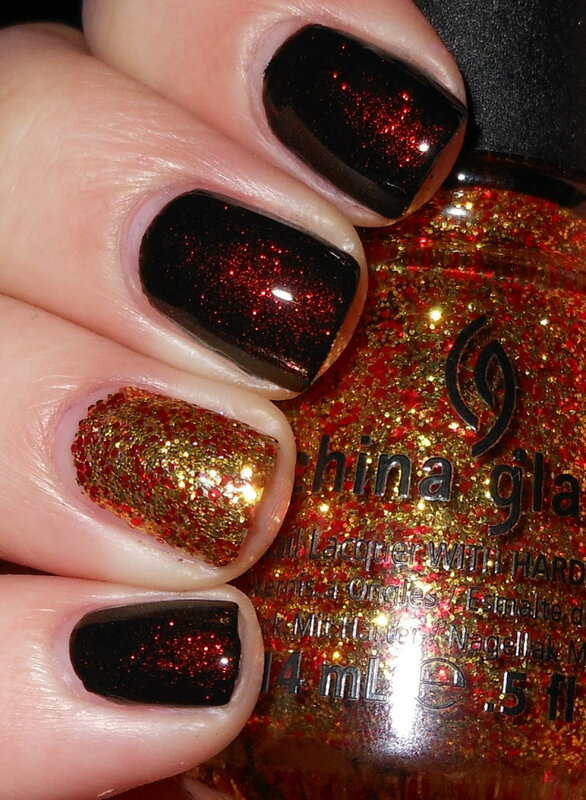 I was wearing CG Smoke & Ashes which just ended up looking like a bumpy black creme (meh!) so I added some CC Covered in Diamonds since I opted not to get Luxe & Lush. The flakie goodness helped, but I still wish I'd had some time to add in fire and flame action. Love your combo though! Love it! I'm going in about 2 hours to see the movie; I'm so excited!!! I think any Hunger Games fan will never tire of the hype over the first movie! I am anxious to hear from someone who has seen it. I won't go for another week or so. Like your HG mani....love Girly Bits - I gotta get Hippy Hop from Pam! I am nuts over getting that one for pastels and lighter shades I am into right now. Love this! Shift Happens looks AMAZING. Fantastic mani! I'm liking the combination with the accent nail. I had Riveting on earlier today when I went to see the movie. I really enjoyed it! The movie, that is. Well, Riveting as well, of course! But yeah, the movie was great- I think they did really well with adapting the novel to the big screen, especially considering that the book was written in first person. Eager to hear what you thought of it! Love it! It looks great! Hope you had an awesome time at the move; I'm gonna wait a week or so to see it and I am sooooo excited. Very nice! Hope you enjoyed the movie!